A threshold ring signature scheme enables a set of users to sign a message such that a finite set of possible signers (the ring) is identified, without revealing which subset of ring members actually produced the signature. A recent proposal of Aguillar et al. introduced the first code-based threshold ring signature scheme which large signatures (about 20KBytes per member of the ring for 80-bit security). We propose a new code-based threshold ring signature scheme that achieves small signature size of 675N − 228ℓ bits, where N is the number of members in the ring and ℓ is the number of signers, for a security level of 80 bits. 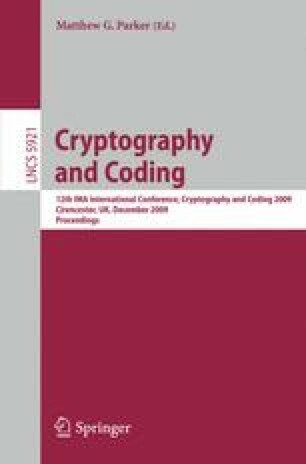 We give a security proof of our scheme whose security relies — in both random oracle and ideal cipher models — on two coding theory problems, making our scheme the first provably secure code-based threshold ring signature scheme. Unfortunately, as often in code-based cryptography, the presented scheme leads to very large public keys.